Dental Implants provide a look and feel that's very close to natural teeth. Implants are metal posts or frames surgically placed beneath your gums. After placement, the implants fuse to the bone of your jaw and act as artificial tooth roots. Replacment teeth are attached to the implant. The implant remains below your gums and the bone grows to hold the implant securely in place. 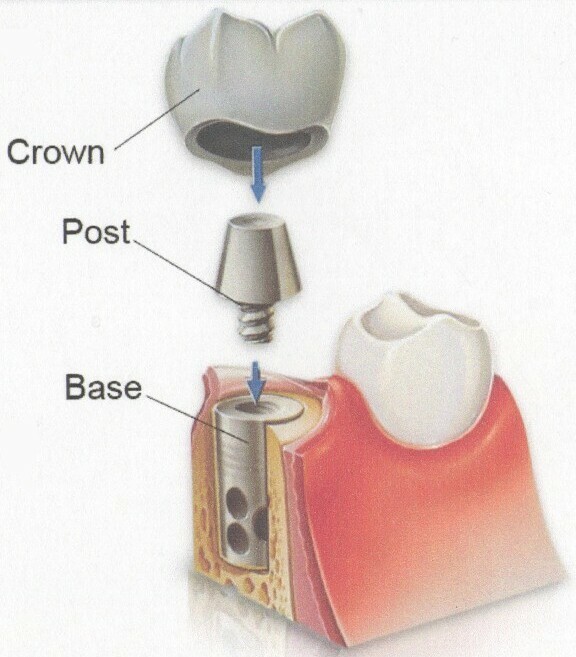 This allows the implant to function much like the root of your tooth, providing a stable structure that will eventually become the base structure for a new crown (replacement tooth). Dr. Noetzel with the collaboration of a periodontist or an oral surgeon can coordinate your implant procedure. The process of getting implants requires a number of visits over several months. We would refer you to either specialist and have you set up with their office for the beginning process of your implant. X-Rays and impressions are taken of the jaw and teeth to determine bone, gum tissue, and spacing available for an implant. Implants are made of metal, commonly titanium because it's proven to be compatible with bone and other tissues. While the area is numb, the implant will be surgically placed into the bone and allowed to heal and integrate itself onto the bone for up to six months. Depending on the type of implant, a second surgery may be required, this step may take one to two months to complete. Once the periodontist or the oral surgeon gives a clearance for the restorative part of the implant, you are to come see Dr. Noetzel for impressions of an implant crown. Because the implant fuses to the bone in your jaw, the new tooth is stable. It won't shift in your mouth like a removable bridge or denture. Since the bone holds the implant in place, you have a natural looking tooth that will function much like your original tooth. You start off with a consultation because not everyone is a candidate for implants - the gum tissue and bone must be in optimum health for the process to be successful. Ask Dr. Noetzel for an assessment to determine the best course of action for you.